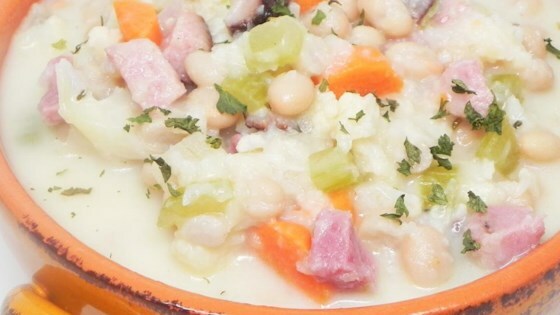 "This bean soup is thickened with a mash of potatoes, cauliflower, and carrots. Delicious comfort food! It is gluten-free and can be made dairy-free by using olive oil instead of butter and unsweetened soy milk in place of cow's milk. Enjoy!" Very good and very filling soup ,but it needed more broth then written. Going in my recipe box. My entire family LOVED this soup! I went with the other reviewers recommendations and doubled the chicken broth. I also doubled the ham. This is a very filling and comforting soup.